LONDON - A regional press ad for an NHS hospital booking service in the North-East has been withdrawn by the Advertising Standards Authority. NHS hospitals have only been allowed to advertise since last April and this is the first time they have been found to be in breach of the CAP Code. 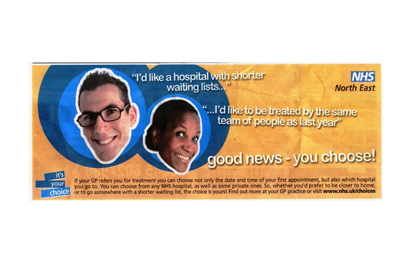 The ad showed two heads alongside quotes stating "I’d like a hospital with shorter waiting lists" and "I’d like to be treated by the same team of people as last year". Larger text claimed: "Good news – you choose!" Further copy detailed how patients could select the date, time and hospital for their first appointment at any NHS hospital as well as some private ones. Patients were directed to a website or their GP practice to find out more information. A GP complained about the ad, challenging whether it was misinformative in claiming that patients could choose from any NHS hospital. NHS North-East said the ad had only been run in the North-East and that the aim of the ad was to raise patients’ awareness of their entitlement to choose the place, date and time for their initial non-emergency and scheduled hospital referrals. The ASA noted that although this choice was national policy, NHS North-East had not provided evidence that showed that this system worked in practice. In addition, the watchdog acknowledged that the experience of the GP who had contacted them in terms of this system was that it was not always possible for patients to book appointments at their chosen hospital. The ASA found that the ad suggested patients had a choice over date, time and place without proper evidence and for this reason it could mislead readers. The ad must not appear again in its current form.